Last time not worn: 2006, though it’s only been worn by coaches since then. 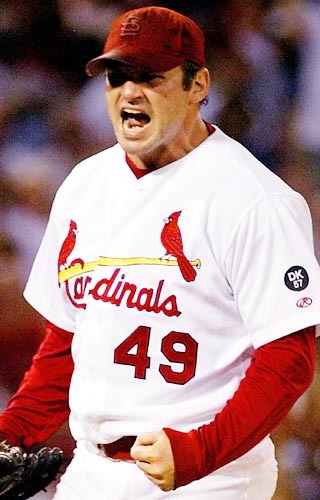 Then there’s the story of Ankiel, who wore 49 when he made his first return to the big leagues. He was still a pitcher then, not the flame throwing youngster that we knew wearing 66 nor the slugging outfielder that’d wear 24 in a couple of years. This was him returning as a reliever and he garnered the last win of his career wearing these digits. However, for folks that have been following this team closely since the turn of the millennium, perhaps nobody stands out more than Kline. The left-handed reliever was everything you’d expect out of a left-handed reliever. Whether it was wrestling his teammates in the clubhouse or giving Tony La Russa his one-finger salute from the bullpen when he didn’t get to come into a game, Kline seemed to live everything a bit larger than most baseball players. Kline spent four years in St. Louis and moved on before he got a World Series ring, but he added color to a team of pros. There’s no doubt Kline was a fan favorite (a blogger one as well–I hear one Winter Warmup he regaled the UCBers there with great, though unprintable, stories) and he’ll always be welcome at card shows and gatherings in Arch Land.